The rofessionalism of Mr. Cochrane's work really shows since nearly all his shots were made with a tripod, and its all on 16mm film. Being a combat photographer during the war gave him vast experience when shooting the New Haven Railroad during peacetime. This program is mainly diesels, but there is one 10-minute segment showing the last excursion for 3016, the last 2-8-2 steamer to operate on the New Haven which was later scrapped. This trip was in 1953. You will see a wide variety of diesel power including DL109's, and Alco Road Switchers, Geeps, and FL9's, plus ALCO FA's. There is a short but exciting electric section with a variety of locomotives as well. Watch semaphore signals drop on the Highland Line, and see RDC's, 4-unit FA's on the Maybrook Line, and much more. The original show was around 60 minutes, but when the DVD was made in 2009 an additional segment also shot by Mr. Cochrane was added to the program. This section was an RDC excursion to Cape Cod. Like most older footage these had no sound, so we have added music and informative narration, with loads of great historical information provided by the New Haven Railroad and Technical Association. There is a wealth of great footage to enjoy in this program. Steamboy (Revere MA US) on 2017-02-03 06:38:25. The music, the narration, the life of railroading in southern New England, this is what it supposed to look like before outer space travel approaches. Jeffrey Ornstein (Brooklyn, NY) on 2011-01-31 17:17:13. I'll get right to the point - I was really disappointed with this video. Given the decription, I was really looking forward to some great camera work and sharp images. But unfortunately, that was not the case. To begin with the dvd is a poorly transferred copy from a VHS tape. From the opening credits, it looks quite amateurish. Now on to the content. There's lots of images of DL109's and FA units as well as RDC units. That's a nice combo, given the rarity of these kinds of equipment on any video. But the image quality is often so poor that it makes it difficult to watch. Detail gets lost in dark areas, which is very prevalent. The original film is full of splotches and hairs and what not, with no attempt to clean anything up in the digital transfer. And then there's the music. My gosh. Either I felt like I was waiting for a Shakespeare play to start, or I was entering a children's three ring circus. The music definitely did not match the feeling of the content of the images. The video ends with a 17 minute film on an excursion of a lash-up of at least 5 RDC cars. Sounds great, right? Well, not so fast. You see very little of the cars. What you do see mainly, is a view from the back window of the RDC, and that itself isn't really interesting to watch. Maybe if I play it backwards, it would be an improvement. The map that was part of this add-on was quite laughable and was pretty much the only high point of this video. Bottom line: only buy if you can get it on sale. A really big sale! Got a sad email from Greg. He told me that narrator John Edward Hingsbergen died last November. Pass it on to the Railfans you know. Boxcar Mike (Santa Ana, Ca.) on 2012-08-09 15:11:27. This is definately an interesting video. But quality wise it suffers badly. It looked as though I was watching somebody`s home movies using a projector and screen. The subject matter (the New Haven itself) is kind of interesting but I was also hoping to see more of the new NH paint schemes as well as some of their main line trains. One thing that really bugged me was the addition of the music. I didn`t get that trackside feel of the program but felt as though I was sitting in a concert hall. Please leave Handel`s Water Music and Organ Concerto for the classical afficiandos. It simply didn`t do this video any justice. There is a video that treats the NH mainline trains in detail--EP5s especially as well as the "wash boards". 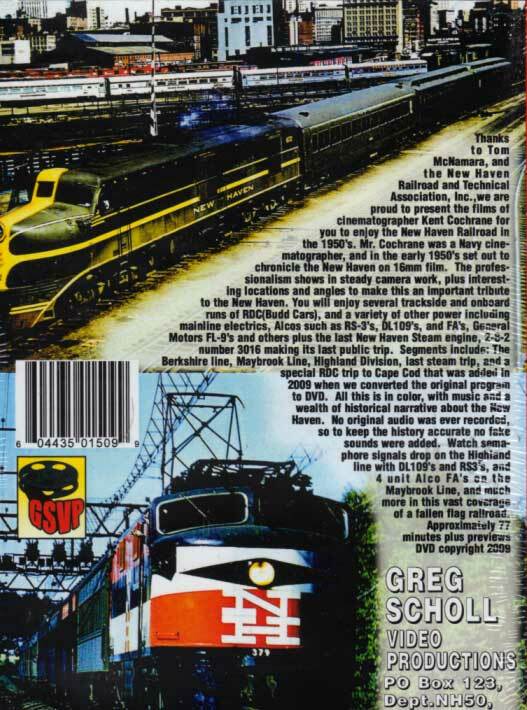 In fact, I think the title is simply, "New Haven Railroad Mainlines". As for quality, I think a lot of what we watch on these discs is transferred film from 1940s and 1950's movie cameras which had no sound. As for the music, I feel an elegant railroad like the NH deserves Handel and Vivaldi, rather than some rock schlock one hears at a rock "concert".